Summary: Combining the timeless fairy tales that we all read as children with the out-of-time technological wizardry that is steampunk, this collection of stories blends the old and the new in ways sure to engage every fantasy reader. Inspired by Hans Christian Andersen’s “The Red Shoes”, New York Timesbestselling author K. W. Jeter’s “La Valse” forges a fable about love, the decadence of technology, and a gala dance that becomes the obsession of a young engineer—and the doom of those who partake in it. In “You Will Attend Until Beauty Awakens”, national bestselling author and John W. Campbell Award winner Jay Lake tells the story of Sleeping Beauty—and how the princess was conceived in deception, raised in danger, and rescued by a prince who may be less than valiant. The tale of “The Tinderbox” takes a turn into the surreal when a damaged young soldier comes into possession of an intricate, treacherous treasure and is drawn into a mission of mercy in national bestselling author Kat Richardson’s “The Hollow Hounds”. In “The Kings of Mount Golden”, Hugo and World Fantasy Award nominee Paul Di Filippo tells the story of a young man’s search for his heritage and a mechanical marvel that lies at the heart of a sinister pact in this fascinating take on “The King of the Golden Mountain”. Alright so I have not begun to read this book yet, but I am very excited for it. I saw the cover and just had to pick it up. Also, I love fairy tales. If I could just read fairy tales for a living, I would. I have actually never heard of some of the stories that are retold in this anthology, which only added to my excitement. I also hope that this book’s steampunk theme will make up for all the bad steampunk I have read in the past few months. I want airships, automatons, gadgets, and goggles! Is that so much to ask? Well we will find out once I sit down and read through the stories. I highly doubt that I will read them all at once, so my next review may just be on one or two of them. Goodreads readers gave the book a 3.57/5, which isn’t too bad and to be perfectly honest, the readers on Goodreads and I don’t always see eye-to-eye on books. Most of them thought the Time Machine was a good book. 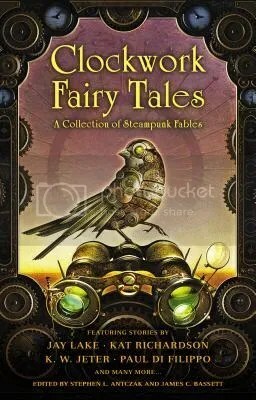 This entry was posted in Personal, Uncategorized and tagged Book Blog, book review, Clockwork Fairy Tales: A Collection of Steampunk Fables, Dreaming With Ink, fairy tales, Michelle’s Paper, retellings, science fiction, Steampunk, to read by dreamingwithink. Bookmark the permalink.